Happy World Card Making Day all!!! Kraftin' Kimmie's weekly challenge this time around is "Spooky Sweet." 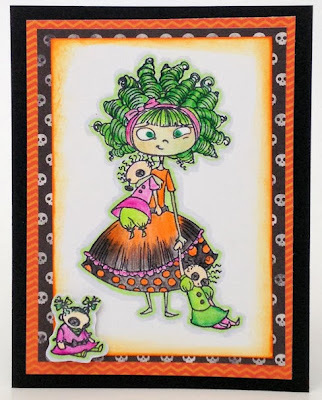 While I don't have any KK Halloween stamps per se, Charlotte is tweeky enough to do the job nicely. I so totally love the shading of her dress! Thanks for joining us at The Corrosive Challenge, good luck! Oh I think this definitely fits the challenge, I love Charlotte and the green hair is awesome! Thanks for playing along with us at Kraftin Kimmies! I just love this! Thanks for joining us at The Stamping Boutique. Love the image!! Your colors is fabulous!! Glad you joined us at The Stamping Boutique!! o did this ever make me smile! super aaaaaaaaaa dorable! thank you so much for joining us at TSB! oh my goodness, your coloring is awesome! Thanks for joining in our challenge at THE STAMPING BOUTIQUE! Superb image! Thank you so much for joining us at the Sarah Hurley challenge Blog! !